New Delhi: The five permanent members of the UN Security Council (US, UK, France, Russia and China), known as the ‘P5’, are all set to move the UN 1267 Sanctions Committee to get Jaish-e-Mohammed chief Masood Azhar listed as a global terrorist, diplomatic sources have told ThePrint. On the day India struck the JeM’s biggest terror camp at Balakot in Khyber Pakhtunkhwa province of Pakistan, sources said the P5 were now united in “coming down heavily” on the terror organisation. The JeM is already proscribed by the UN, but enlisting Azhar as an individual continues to be the biggest hurdle, because China has thrice vetoed the proposal. Azhar was the mastermind behind the attack on Indian Parliament in December 2001 and the Pathankot airbase in January 2016. His JeM claimed responsibility for the 14 February Pulwama terror attack in Kashmir, which killed 40 CRPF personnel. The US, UK and France have all been victims of terror activities linked to the JeM, and are concerned that if action is not taken against the organisation and its chief, as well as Pakistan, which harbours such terror organisations, it would be a long time before such an opportunity presents itself again. This is why these countries are now trying to convince China to act against Azhar this time around. 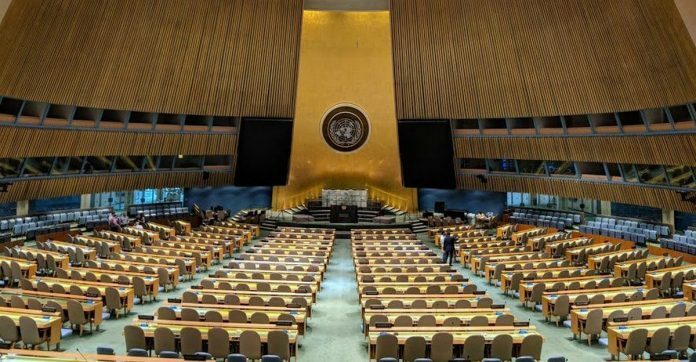 “The US, UK and France are now all ready to present their own proposals to the UN so that the meeting of the 1267 Sanctions Committee can be convened soon, and action is taken once and for all. The international community is now behind India,” said a senior diplomat from one of the P5 countries. What is the 1267 Sanctions Committee? Under the UNSC’s 1267 Sanctions Committee, once a terrorist organisation is enlisted, it faces sanctions such as assets freeze, travel ban and arms embargo, etc. The committee comprises all 15 members of the Security Council and makes its decision by consensus. The current chair of the committee is Indonesia. According to UN laws, the committee is mandated to oversee the implementation of the sanctions measures, designate individuals and entities who meet the listing criteria set out in the relevant resolutions, consider and decide upon notifications and requests for exemptions from the sanctions measures, examine reports presented by the monitoring team and report annually to the Security Council on the implementation of the sanction measures, among other things. The task of bringing China on board continues to remain a challenge for the remaining four members of the P5. This time, though, the US and France in particular are hopeful and are working towards bringing China on board, said another top diplomat from one of the P5 countries. However, Michael Kugelman, South Asia expert at the Washington-based Wilson Centre, explained that it was easier said than done. “As far as Beijing is concerned, there’s never been a more important time to assert its friendship with Pakistan, and so agreeing to enlist Azhar would send the worst possible signal at the worst possible time,” Kugelman told ThePrint. China Tuesday urged India and Pakistan to “exercise restraint” and asked New Delhi to carry out its fight against terrorism through international cooperation, even as it referred to both India and Pakistan as “important” countries in South Asia. A day after the Pulwama attack, Chinese foreign ministry spokesperson Geng Shuang had said China had vetoed the earlier proposals to enlist Azhar because the UN’s procedural rules had not been followed. Meanwhile, at an informal meeting of the plenary on the intergovernmental negotiations Monday, India’s Ambassador to the UN, Syed Akbaruddin, had taken a veiled dig at China’s earlier vetoes, saying the use of the veto had been extended to the subsidiary bodies of the Security Council. “Any member can block or object or place on hold any request of a member state, thereby in effect killing the proposal on grounds that unanimity is required. By a procedural stratagem, veto has been expanded to all members of subsidiary bodies of the Security Council, rather than being subject to restraints,” Akbaruddin had stated.